“There is no negotiating with the cross: one either embraces it or rejects it,” Pope Francis said in his Palm Sunday homily yesterday. Source: CNS. Thousands of people gathered in St Peter’s Square yesterday to commemorate Jesus’ entry into Jerusalem and the beginning of his passion. 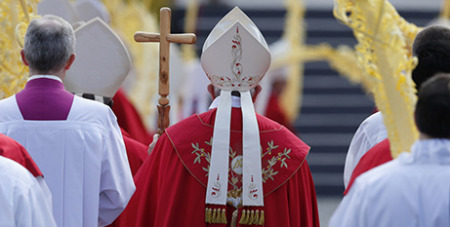 The procession to the obelisk in the centre of the square included dozens of young people carrying palm branches taller than they were, while bishops, cardinals and Pope Francis carried “palmurelli”, woven palms. All pilgrims in the square were given olive branches donated by an Italian association of olive oil producers. After blessing the palms and listening to the Gospel reading of Jesus’ entry into Jerusalem, the young people, bishops, cardinals and the Pope processed to the steps of St Peter’s Basilica for the main part of the Mass, which included the reading of the Passion. At the Vatican and in many parts of the world, Palm Sunday is also marked as the local celebration of World Youth Day, and Francis spoke specifically to young people in his homily.